A behind-the-scenes look at the nascent field of humanitarian medicine as it has evolved in recent years of civil wars, famines, tsunamis, and other natural and man-made disasters. Since 1990, world conflicts and refugee crises have spurred the growth of a massive force of humanitarian aid workers—some 275,000 individuals with the United Nations and NGOs, most of whom lack the formal training needed to deal with complex events like the catastrophic 2010 Haiti earthquake. In that 25-year period, more than 1,000 aid workers were killed in attacks on hospitals, medical staff, and civilian patients. 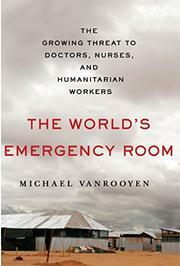 VanRooyen, a professor at Harvard Medical School and the co-founder and director of the Harvard Humanitarian Initiative, came of age professionally in the fields of emergency medicine and humanitarian medicine, which are the focus of this fascinating debut. “What the emergency room is to Detroit, Chicago, and Baltimore, humanitarian medical relief is to the world’s crisis zones,” he writes. Whether in an unstable inner city or a failed state, doctors provide a safety net of emergency health care for people with critical needs. The author recounts his experiences on the ground as an emergency physician in Bosnia, Chad, the Congo, Haiti, Somalia, and many other countries and how he and like-minded colleagues have sought to professionalize humanitarian efforts, which have frequently been criticized as uncoordinated and wasteful. (The Haitian relief effort was a “humanitarian free-for-all,” he writes, involving novice agencies, inexperienced surgical teams, and “disaster tourists.”) In 2005, VanRooyen and others established the Harvard Humanitarian Initiative, a first-of-its-kind, universitywide effort to pursue research, training, and innovative approaches to humanitarian aid that could be leveraged to achieve policy changes. Despite the subtitle, the author devotes relatively little attention to the increasing dangers facing aid workers, focusing mainly on the need to establish rigorous standards for the field in order to prevent the malnutrition and infectious diseases that are the biggest killers in communities in conflict. An important account of medicine’s role in a world in crisis.